Remove the vacuum hoses and vacuum piping. Check for correct installation, damage and deterioration of the vacuum hoses and pipe. Connect a suitable tool at each end of the vacuum hose with built-in check valve to inspect the check valve operation. Vacuum applied at booster end : Refer to BR-54, "Check Valve". Vacuum applied at intake manifold end : Refer to BR-54, "Check Valve". Replace the vacuum hose with built-in check valve if out of specification. 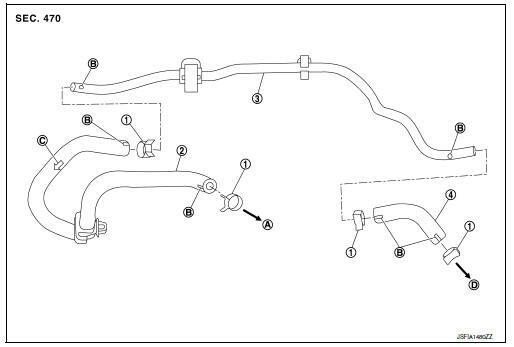 When installing vacuum hose, insert it until its tip reaches the back-end of length (A) or further as shown. Face the paint mark of vacuum hose (build-in check valve) (intake manifold side) to vehicle right side to assemble. Face the paint mark of vacuum hose (build-in check valve) (brake booster side) to vehicle front side to assemble. Face the paint mark of vacuum piping (intake manifold side) to vehicle front side to assemble. Face the paint mark of vacuum piping (brake booster side) to downward to assemble. Face the paint mark of vacuum hose (intake manifold side) to downward to assemble. Face the paint mark of vacuum hose (brake booster side) to vehicle front side to assemble. For clamp mounting direction (the orientation of pawl), refer to BR-36, "Exploded View".